Many children – and adults too! – have special needs, and we want to do all we can to help those individuals with their learning adventures. Whether a child is struggling with physical disabilities or autism, or an older adult is challenged with Alzheimer’s or dementia, music can help in many ways. Music is a multi-sensory experience that is processed in both hemispheres of the brain. Playing a musical instrument is a non-verbal way of communicating which can help those who struggle to speak. Research has shown that playing music can increase the capacity for memory, enhance coordination, and sharpen concentration. As importantly, music fosters self-expression and relieves stress. Playing music with another person is a great opportunity to bond, and on top of that – it’s fun! We are here to help! We would love to know how you are using your Up-a-do Unlimited instruments, and we welcome your ideas and comments! Instrument Stability Help: If you need the glockenspiel xylophone to be more stable so that the musician does not knock it around, you can consider gluing or clamping it to a board – a wood cutting board could work. Music Book Help: For individuals who cannot see the music book while it lies on the table, you can use a nail brush as a music stand. Mallet Help: A mom whose son has cerebral palsy recently spoke with the Upado Unlimited crew. She said that his condition makes it difficult for him to hold the xylophone mallets, so we helped her come up with a way that he could hold the mallet and play by wrapping a kitchen sponge around the handle. 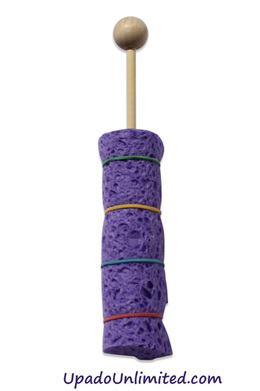 ​For students who lose hold of the mallet because they cannot keep a strong grip, you might consider attaching a soft piece of elastic to the end of the mallet and placing it around their wrist so that it is easier for the student to retrieve the mallet. Safety is important! An instrument with a mallet can have potential dangers – so it is vital that all special needs individuals have a support person with them at all times when playing any musical instrument. It may be necessary for the support person to place his or her hand over the hand of the musician to give added safety and control. "You might think this is an unusual Glockenspiel purchase but I actually got it to help my young niece learn to read. She is 8 but reading at a K-1 level. I put letters on the Glockenspiel keys. Then I show her a short word written on a 3X5 card, ask her to read the word (with assistance as needed), turn the card over and ask her use the wooden mallet to spell out the word by hitting each "letter" key on the Glockenspiel. She likes the sound and action and I can keep her attention much longer than I can when I just give her a short story or list of words to read."